This adorable New Year’s Cake is the perfect dessert for ringing in the new year! 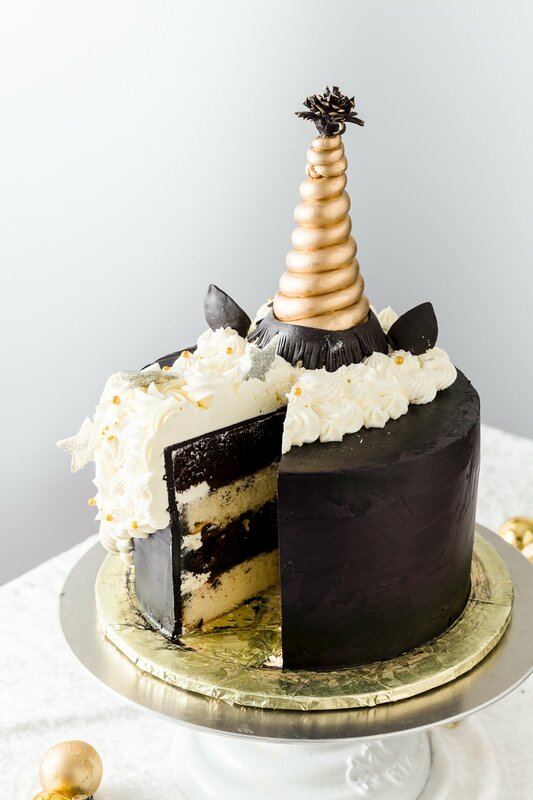 It’s a New Year’s version of the ever-popular unicorn cake. This amazing cake was created by Lia Weber. Her step-by-step instructions and best tips are below. To make this New Year’s cake, start with your favorite cake recipe. I recommend my best vanilla cake! If you want to get fancy, you can layer chocolate and vanilla cakes with chocolate ganache in between like Lia did. Frost the cake with super black buttercream. Buy more than you think you will need. It takes a lot of black to make the buttercream look truly black versus dark purple. You can use any frosting that you like. My go-to frosting is my vanilla bean buttercream, but for this cake I would suggest using vanilla extract instead of vanilla bean paste as you don’t want any speckles. Tip: If you need to learn how to smoothly frost a cake, I strongly recommend taking some classes on Craftsy or with Lia directly (if you happen to be in St. Louis). Pipe rosettes onto the cake with your favorite vanilla buttercream using 1M and various other star tips such as #20, #32, and #18. Tip: To pipe a rosette, start piping in the center of the rosette and swirl outward. Pipe on eyes (no need for eyeballs) with royal icing using a #3 tip and paint with gold luster dust. Tip: Use a paint brush to paint on the luster dust. To make the unicorn ears, roll out some white and black fondant. Cut two larger ears out of the black fondant, using a leaf cutter or large rose petal cutter. Then, using a smaller cutter and white fondant, use the same technique to cut two smaller ear shapes for the insides of the ears. Paint the smaller ears gold using vodka and gold luster dust. Place the smaller gold inner ear on top of the larger black ear. Use a dab of water underneath to glue them together. Pinch the ends together to form a crease and set in cupcake liners or a flower former to dry. Insert a cake pop stick into a Styrofoam cake dummy, letting it stick out about 4 inches (this will help you determine how tall the hat/horn will be). Roll out a tapered rope of fondant. Use white fondant instead of the black fondant shown in these photos. Twist the tapered rope around the cake pop stick until you reach the top. Brush with vodka and gold luster dust. Tip: Plan ahead. Let the horn dry for several hours before placing on the cake. Roll out a long piece of fondant about 1/2 inch wide. Cut slits, leaving a strip at the top. Wrap around the base of the unicorn horn/hat. Cut out a circle and, using a pastry cutter, make slits about 1/2″ into the circle all the way around. Pinch the bottom underneath the circle to form into a pom pom shape. Insert a toothpick and let set standing up in a small bottle to dry. Paint the edges of the fringe gold with vodka and gold luster dust. Cut out stars from white fondant using a cookie cutter. Paint with vodka and then shake silver disco dust on top. Let dry. Plan ahead. You can make the ears, horn/hat, and stars in advance so they’re ready to be put on your cake. If the eyes don’t come out perfectly when you pipe them on, use a toothpick to wipe them off and then try again. Pipe lots of rosettes in different sizes – the more the merrier. Have some champagne on hand so you can celebrate while you decorate! If you like this post, also check out the Halloween witch unicorn cake Lia created. If you make this cake, post a photo of it on Instagram and tag @cupcakeproject and @madebylia so we can see it!! Lia Weber, Owner of MADE. BY LIA, creates custom-designed, from-scratch wedding cakes and specialty sweets in St. Louis, Missouri. She is an accomplished pastry chef, cake artist and winner of TLC’s Next Great Baker, Season 4, with Buddy the Cake Boss. Lia is the Baking Ambassador for AB Mauri North America, an innovative baking & technology company. She runs her business out of their BakingHub located in the Cortex district in the Central West End. MADE. BY LIA has received The Knot best of 2017 and Wedding Wire’s Couples Choice Award and is the recent winner of the Feast Magazine-Midwest Readers Choice Awards, “Pastry Chef of the Year, 2017.” Lia’s love for baking began in her mother’s kitchen & she hopes to pass on the same passion to her daughter, Ella. Someday soon, Lia plans to start a YouTube channel teaching the ‘at home baker’ simple yet delicious from scratch recipes. Until then, stay up to date on the latest cake trends by following her on Instagram @madebylia, Facebook MADE. BY LIA, and on www.madebylia.com.